Mobility lifters specialize in lifting a mobility device such as a wheelchair, scooter, or power chair into vehicle. There are many types of lifters available to suit the many different types of mobility devices and vehicle types out there. Give us a call to discuss which lifter may be right for you! The Curb-Sider by Bruno is a versatile lifter that can accommodate up 400lbs of capacity. Custom sub-assemblies allow this lifter to be installed in many different vehicles. 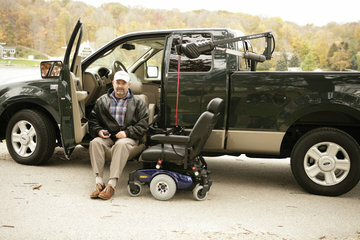 An optional flip down head allows for maximum space when not carrying the mobility device. The Joey by Bruno is a platform lift designed for today’s mini vans. 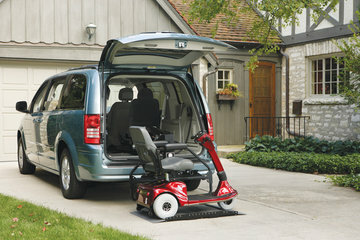 This lifter requires little effort by the user to lift the mobility device into the back of a mini van. Optional retractable tie downs make securing the chair or scooter a breeze. For vehicles with smaller openings, The ASL-250 by Bruno may be the answer. 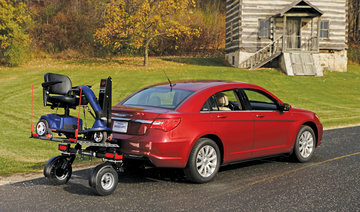 Mounted in the hitch of a vehicle, this lifter carries the mobility device on the outside of the vehicle. 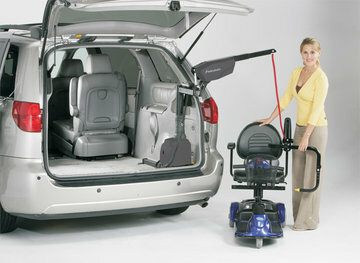 An optional Swing-Away kit allows the lift to be moved away so the the rear hatch of an SUV or mini van can be opened. This lift is also great to keep as much interior space available as possible. For those who prefer a pick up truck over a mini van or SUV, Bruno offers the Out-Rider. This lifter is mounted in the box of a truck near the cab. The arm will lift the mobility device out of the box and set it down near the driver or passenger door. This lift is perfect for someone who would need to transfer directly from the vehicle seat into the mobility device. Different arms and capacities give it a wide range of trucks & mobility devices that it will accommodate. The Chariot by Bruno is a “one of a kind” lifter. 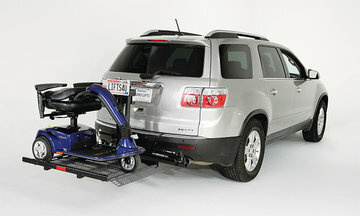 Designed to be installed behind sedans and smaller SUV’s, this lifter has 2 independent wheels that support the weight of mobility device so the back of your vehicle won’t “sag”. The platform folds up when not carrying a load to minimize length.